Let us customize a LifeRoom for you and turn the ordinary into the extraordinary. LifeRoom can transform any dull, ordinary backyard into an amazing outdoor haven that directly reflects your personal style. Now your friends and family will look on in awe, as you pick up LifeRoom’s remote control and raise or lower the fully automated screens to create the ultimate environment for entertaining, watching movies or just plain relaxing. 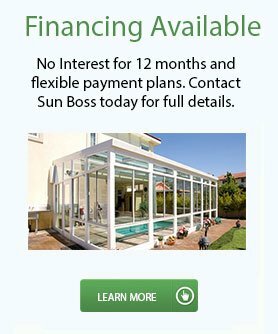 Enjoy your own backyard like never before. If that isn’t enough, you’ll be happy to know that a LifeRoom adds extra living space and can increase the value of your home. 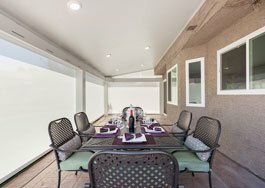 Adding a LifeRoom to your home instantly affords you the incomparable freedom to once again enjoy the romance and beauty of the great outdoors, right in your own backyard. LifeRoom can instantly adjust to your mood and Mother Nature’s. 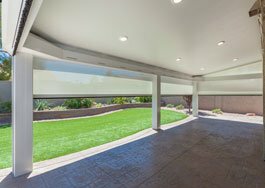 With the screens up, LifeRoom is a wide open sanctuary, want a little privacy? Just lower the side screens. If the bugs come out… relax and just lower all the screens and enjoy the beauty of your own backyard without having to worry about anything… ever again. LifeRoom will be your new favorite romantic restaurant, and you’ll never need a reservation. LifeRoom’s fully automated screens descend around you and your friends at the touch of a button. 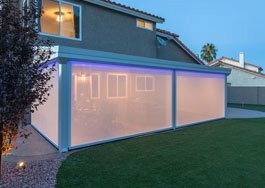 The attractive, remote controlled retractable screens instantly provide protection from inclement weather, pesky flying insects and nosey neighbors. So now, you and your guests can party all night long. 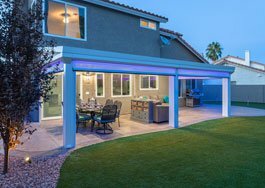 LifeRoom’s soothing LED lighting turns your backyard into the trendiest VIP room in town. Relax and just enjoy the beauty of your own backyard without having to worry about Mother Nature’s wrath, ever again. LifeRoom, the first outdoor room that can become an indoor room, instantly… all at your command. Whether it’s game night, or movie night… LifeRoom satisfies the most demanding fans. Round up the kids and your neighbors… LifeRoom’s got the biggest screens this side of Hollywood. Imagine, watching movies, TV shows and sporting events right in your own backyard. 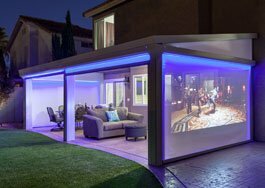 LifeRoom’s fully automated retractable screens not only keep unwanted flying pests out, but they are uniquely designed to serve as amazing projection screens for any home theater. And the great thing is, this theater is never sold out. You’ll always have the best seat in the house! 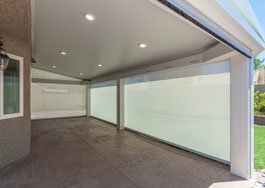 LifeRoom takes being “cool” to a whole new level with its innovative, unique, Cool Mist climate system and Soft Breeze technology. Enjoy your LifeRoom even on the hottest days. Imagine, a cool mist so ultra fine that it actually disappears as it cools the air around you. 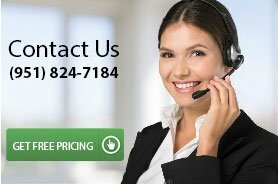 In fact, you can enjoy a temperature reduction of up to 40 degrees. Plus, LifeRoom’s protective screens can block an amazing 95% of the sun’s harmful UV rays, so you and your loved ones can enjoy a healthy, safe way to relax and play outdoors. 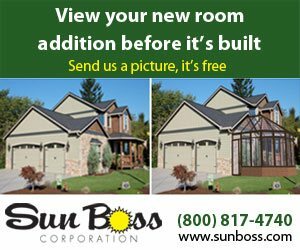 LifeRoom, your oasis retreat protects you from the blazing and stifling sun. Created by a prestigious team of engineers and designers, with over 20 patents to their credit, There’s even a Cool Mist climate system that can reduce the room temperature up to 40 degrees.